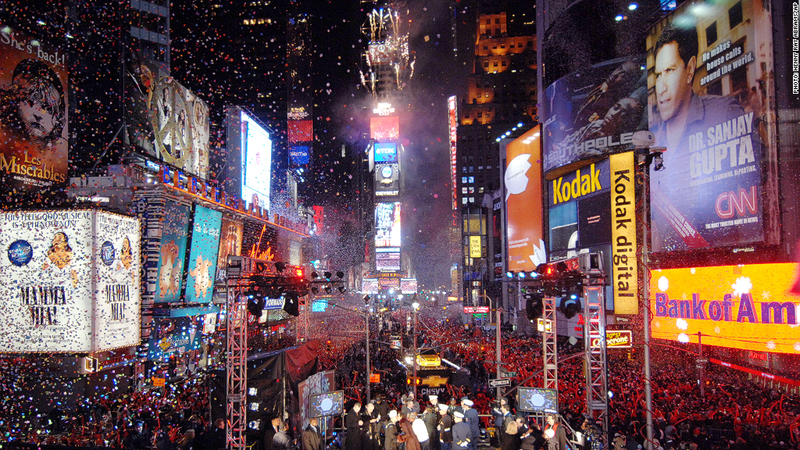 About 1 million people are expected to ring in 2014 in Times Square. For a premium, you can avoid the crowds. Even if your New Year's resolution is to spend money more wisely, there's still time for one more splurge on New Year's eve. Bars, restaurants, clubs and even Madame Tussauds wax museum are pulling out the stops to throw extravagant parties ringing in 2014. Of course, you don't have to spend a dime to watch the ball drop in New York City's Times Square - a frigid, standing-room-only affair with 1 million of your closest friends. Arrive early, organizers say, and don't expect bathrooms. But to avoid the crowds, you'll have to pay a premium. For about $8,500, for instance, you can celebrate at the R Lounge in Times Square, which claims to have the "most coveted view of the ball drop." That price includes "full premium open bar," hor d'oeuvres, a gift bag and a "butler passed breakfast" after the ball drops. But it doesn't include a room to stagger home to in the attached hotel, which will set you back another $1,500. Even the Applebees in Times Square is advertising New Years Eve tickets for $375 -- many times its usual $20 dinner for two people -- but there's a pretty big catch. The offer's fine print notes that "seating is on a first come first served basis," and that guests will have to step outside to watch the ball drop, "subject to NYPD approval." Tickets to the festivities at the nearby TGI Friday's range from $225 to $1,095. While there is a three-hour TGIF open bar, the venue won't offer any views of the ball drop, since it's seven blocks away from the main event. For a more offbeat evening, tickets to the party at Madame Tussauds wax museum starts at $165, and even includes a with a view of Times Square. Celebrating with the two-headed calf at Ripley's Believe it or Not could cost you as much as $995. If that's not your scene, The Palm in Dubai is promising champagne and a "luxury buffet" -- plus an attempt to host "the world's biggest ever fireworks display." Those tickets sell for about $870. There is another option: just stay home. "In New York City, it's such a miserable night," said Anderson Cooper, who watches over the Times Square celebrations from a CNN platform studio. "There are no cabs. You can't get anywhere. ... There's no reason to go out. It's miserable." "It's so much more fun," he added, "to just stay at home and watch us."